What Would A Credit Rating Downgrade for the U.K. Mean? Renowned credit ratings agency Fitch warned that the U.K. is becoming increasingly vulnerable to losing its prized AAA credit rating. In an interview, the agency’s head honcho David Riley said that the government is losing its fiscal credibility. But I guess it shouldn’t come off as a surprise. After all, another credit ratings agency, Moody’s, had already cautioned the British government that signs of flailing fiscal commitment could result to a downgrade. Remember that in December, Chancellor of the Exchequer George Osborne made his Autumn statement. He had previously promised in March that public net debt would already start to fall sometime around 2015. However, he later said that the recovery is taking its time. The country’s fiscal watchdog, the Office for Budget Responsibility (OBR), now estimates net debt to peak at 79.9% in 2015-2016. The recent roster of disappointing data from the U.K. isn’t painting a pretty picture for the country either. Manufacturing production showed a 0.3% contraction for December and missed the market’s forecast for a 0.5% uptick. Meanwhile, industrial production fell short of expectations by 0.2% just coming in at 0.3%. It’s no surprise that talks of a triple dip recession have once again began to circle in the markets. Yikes! In the unlikely event that the U.K. DOES get downgraded, what will happen to the markets? Now, before I get into that, let me first discuss what a sovereign credit rating really is. Like in any other security, investors look at credit ratings to determine a debt issuer’s ability to repay a loan. In this case, U.K.’s credit rating refers to its sovereign debt, or bonds, it has issued to finance its projects. Countries with weak economic growth usually have low credit ratings as they come with the added risk of not being able to pay back their investors. As a result, they also have to pay more than their high-rating counterparts in order to borrow the same amount of money from markets. This could happen in the U.K. if it gets downgraded. Investors will have to demand higher borrowing costs for holding its bonds. 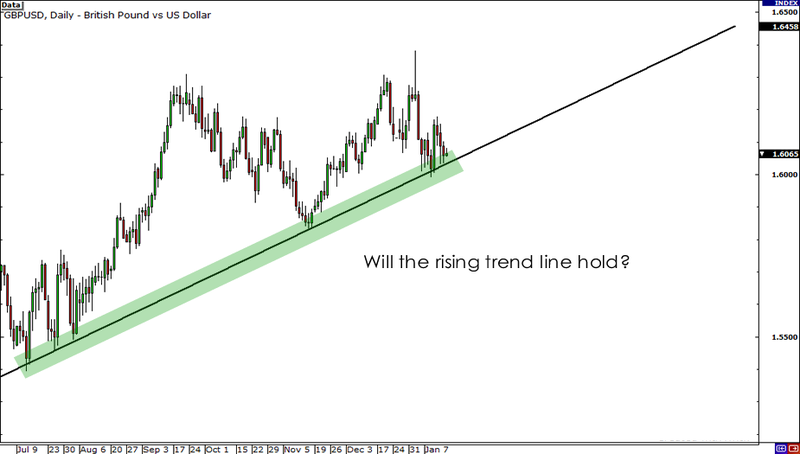 On the daily chart we see that GBP/USD is trading around a rising trend line. A downgrade (or lack thereof) could determine the pound’s fate. Will support hold or will we see a break lower? What do you think will happen? Do you think U.K. will get downgraded?